Karen Fabian is a well-known and respected Boston yogi; you could even say she is one of the original Boston yogis. She's been practicing and teaching for nearly two decades, and found her niche in her bones - quite literally: she is the brain behind Bare Bones Yoga. Her passion for anatomy is clearly evident in her work, and she offers her yoga students a safe and strong practice. Her care and attention to detail is MY JAM! She guides her students gracefully and clearly through every class, and promotes a safe and intuitive movement which helps one tap into one's own body. She manages to offer all of this without being the least bit intimidating or judgmental. Karen is also an incredibly intelligent self-made business women who has worked hard and diligently to support herself and others. She has a genuine sweetness and realness about her, and she's always ready to empower her fellow female. Her service to others comes not only in the form of her teachings in studios, but also in the form of instructional videos, webinars, and literature that she passionately produces on her own. I'm so grateful to have basked in her brilliance and to have picked her brain for this interview, I know you're going to get so much out of it! In late December, I had an amazing opportunity to ​interview one of my favorite teachers, Marc. I try to take his morning yoga class twice a week at my local gym, and find that when I miss it, my life feels off-kilter, completely off-balance. Marc is an OG yogi, a yoga purist, if I may. I don't mean that in a stuffy or snobby way - I mean that he is traditional and true. He promotes moving with one's breath in classes as a way to go inward, focusing on one's self versus what's happening in or out of the room. He offers music that is purposefully selected to avoid being a distraction, but to help induce a meditative state. His presence is strong yet utterly calming, and his sequences are based in Ashtanga yoga, but (forgive me) use more common sense. He meets each class where they are: there's no pressure to hop up into a handstand or slide into a split. The focus is on moving with breath, with intention, with purpose, with an awareness on alignment that doesn't jerk you away from the flow. He doesn't want you to go deeper physically if it's not there - he wants you to feel your body and move into what works, versus forcing something that can potentially cause harm. There's no judgement; there is an expectation of discipline and respect for the practice and for one's body. I'm so grateful to have sat down to interview Marc. I hope you enjoy this interview as much as I enjoy [read as: live for] his classes. Welcome to my first post in what I hope to be an ongoing series on this blog - "On Drishti" is finally up and...stretching, I should say? Below you'll find my interview with one of my favorite yogis... a mini-biography of sorts, a more intimate look; from embarrassing teaching moments to how he found yoga, with some thoughtful inspirational quotes sprinkled throughout. Please feel free to make suggestions on what you'd like to hear more of in the next interview - leave me a comment below, tweet me, IG message me, send me an email...whatever works. Without further ado, I present the first installment of "On Drishti" - enjoy! Ian Lemieux is one of my favorite yoga teachers, as well as one I’ve practiced with the longest. It seemed appropriate to have him be my very first yogi interview for this new series “On Drishti,” especially since he helped inspire it. For nearly two years I’ve vacated my cozy, warm bed at 5:30am to breathe and stretch in his class at my local Equinox. His signature style of Vinyasa and gentle, guiding way of truly moving with each inhale and exhale is incredible, each flow choreographed to move the student in different planes all over one’s mat. Fortunately, Ian graciously agreed to let me pick his brain and ask him all my yogi questions, and we planned to get together after his 6:15pm Wednesday Power Yoga class (which meant this chick did two yoga classes in one day, swoon). We then conducted this interview over a delicious nourishing dinner at Dig Inn, which, if you haven’t gone, you need to close your laptop and get over there. It’s delicious. For all my yogi readers, you'll likely understand the word above; in yoga, a drishti is a focal point or a non-moving area that one focuses on visually while in a pose to assist in quieting the mind to stabilize the body. I'm starting to put together a new series for this blog, and as you can see it will be called On Drishti. The title makes me giggle...why? Well, it's kind of a play on words...any local NPR listeners out there? Yup, you got it. It's a play on NPR's On Point. My plan is to interview some of my favorite yoga instructors and not only get a better sense of who they are as an individual, but how their practice promotes their wellness (not just the wellness of others). I have put together a list of questions I plan to ask them and I'd love to hear your thoughts! Is there anything that you'd want to know about your own favorite teacher? Leave a comment below or on @l_j_d_v. Thanks for your collaboration, I can't wait to hear from you! 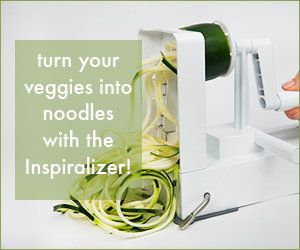 Enjoying my easy, delicious spiralized recipes? and use promo code "LA_JDV" for 10% off by clicking below!